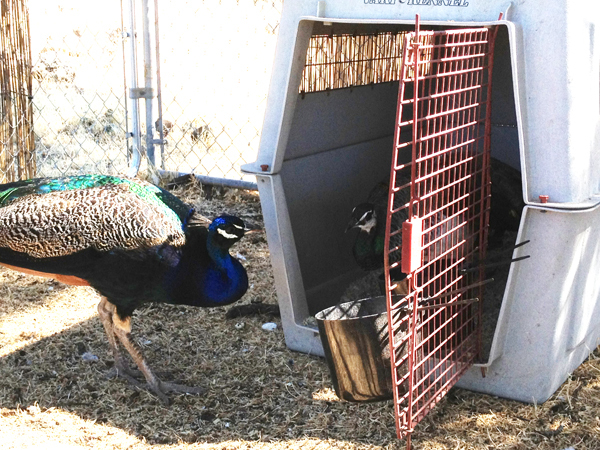 Peafowl: After three weeks of being crated after breaking her leg, I let Nara out of the crate and into the aviary last Monday. She'd been starting to put some weight on the leg and use it for scratching herself, so it seemed like the right time to allow some mobility. She'd seemed pretty content in the crate all along, very calm. She came out quietly, and unlike chickens there was no drama amongst the birds. Omar and Jovi both came up to her and they did a lot standing around quietly with their heads together. Funny birds. And Nara still definitely outranks Jovi. She continues to make progress. She's walking on the broken leg, though she has a severe limp, and I don't think the bone healed straight. But that she's putting her weight on it after just, well, now four weeks, that's impressive. They will stay penned up in the aviary for at least probably another month. I won't release them until she is as healed as she'll get, and until they are totally settled down. 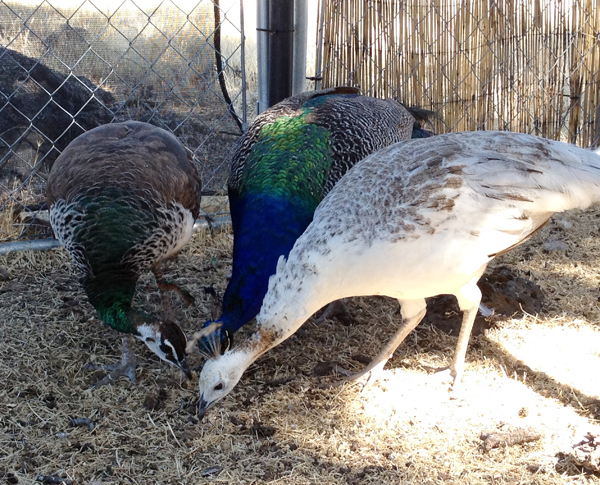 They are MUCH more calm now, consistently coming up to me for treats, rarely pacing, etc. Omar has started to display a lot more often, though they are still very quiet (which tells me they're not settled in yet, he gets pretty loud when he feels like he has a territory of his own!). I think Nara will likely always limp. I just need to be sure that she is able to roost at night. Time will tell. Other animals: I miss them. My old mare Gwen stayed down in Wilton, and there she will live until the time comes for her to go to the great pasture in the sky. A few times in the last few years, I've thought that time was imminent, but thus far she's proven me wrong... Of course I miss Angus, my walking buddy. A lot of my friends were aghast that he wasn't coming with me, but believe me there is NO way that would have worked. I live in less than 400 square feet of space, atop what I affectionally refer to as the "stairway of doom" because it's really more ladder than stairs. That's not a combination of features that would work for 104 pounds of flatulent dog. Life up here: Well, it's hot. But it's hot down in the Sacramento Valley too. Actually it's been rainy up here a few times, which is totally cool. It's so beautiful up here, I go out walking or riding and absolutely marvel at the view. Lassen in one direction, Shasta in another. The loft is sooooo close to totally unpacked. I'm living in it, have been for... uh, maybe two weeks now? It's a pretty awesome space, I have to say. :-) The last of the shelves were just put up yesterday, so I unpacked a few more boxes this morning. Of course that means it's a disaster zone again, so I need to find the time to get it all tidied up and vacuumed for the umpty-billionth time. And then I'll be ready for visitors! I still feel weird using the word "home" for any particular location. It'll happen, but life still feels strange. I've been up here as a visitor so many times in the last 10 (11?) years, there's this strange little "shouldn't I be going home soon?" feeling as though I don't want to overstay my welcome, but well, here I am, they're stuck with me. :-) I'm trying hard to get back into a normal routine though... gettin' there... I seem to have misplaced a number of items (how?! They have to be within this space!!) and there's still a long list of things I need to get. Okay, back to work. I'll show you some progress on a new drawing tonight if I can.